Microgaming are responsible for many online video classics, some of which have shaped the genre into what we know today. Launching the first online casino in 1994 this developer has had over two-decades to perfect their craft, leading to over 850 uniquely designed games - many featuring a signature progressive jackpot. Microgaming’s progressive jackpots have previously landed the team into the Guinness Book of World Records when one lucky player risked a simple 25p spin in Mega Moolah – changing their life with a record breaking cash-out amount of £13,209,300. With returns like that, can you really afford not to play? Click here to see our EasySlots promotions. 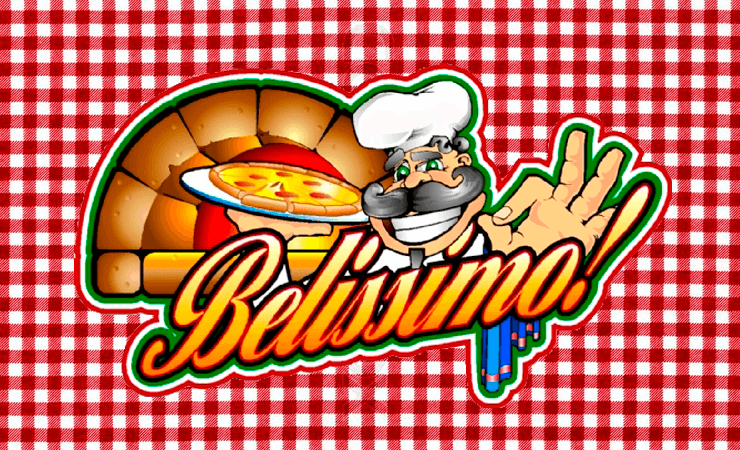 Belissimo is a hybrid of classic fruit machines and everybody’s favourite Italian foods, taking this retro game to a new fictional universe. If you crave pasta, slathered in sauce or pizza engulfed by cheese and an extra side of major cash prizes then Belissimo’s is the place to be. The on-screen layout features the iconic chequered cloth pattern and a permanently displayed pay table. This pay table is synonymous with older style machines and truly a losing art form, allowing players to constantly reference their potential winnings allows for peace of mind especially for casual players. It helps build suspense and indicate the player on their winning progress. Before placing your order, you should always work out your budget. This 3-reel machine contains 5 ready and available paylines for winning combinations of identical symbols. Using the tools at the bottom of the game players should adjust the size of their bet. Activating on a coin system the bet can be set for between 1 and 5 coins per spin, as with all machines the higher the stake the higher the possible reward – luckily for players of this video slot, the permanent pay table is interactive, adjusting with each player selection. Despite the family Italian theme, the symbols found within this machine are far from edible. Players should expect to find BAR signs and 7s in various levels. The BAR symbols can be combined in any formation to grant players the lowest paying recipe. Bigger wins will come from lining up the same level BAR signs in a single payline e.g. 3x Single BAR, 3x Double BAR or 3x Triple BAR. The highest valued base icon is the lucky 7, paying out an amazing 80 coins for 3 matched. 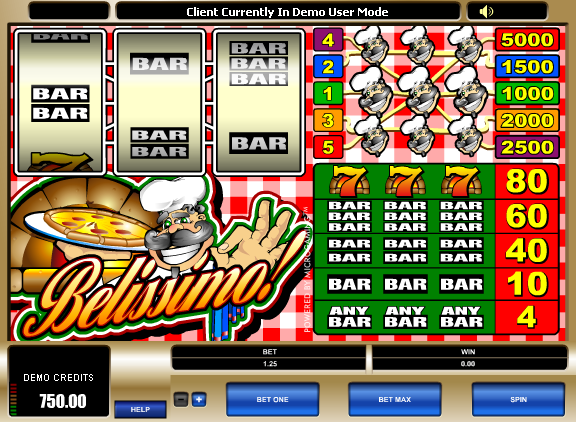 Cooking up these winning combinations, the appearance of the Chef himself will spring a bonus for Belissimo’s. Acting as a Wild symbol he can be used in replacement for any other symbol to allow players to achieve a winning payline, but when he introduces his sous-chefs even bigger prizes can arise. If players manage to 3 of these culinary geniuses in a single payline players could amount a jackpot of between 1000 and 5000 coins! But word to the wise, players must be playing with all paylines active to win the ultimate jackpot and walk away with more than a full stomach. Retro yet rewarding. The layout is synonymous with traditional fruit machines and despite the new aesthetic the symbols have also remained the same for the most part. I feel like this game follows the rule of “if it’s not broke, don’t fix it “as the 3 available reels have packed in as much fun as any standard 5-reel video slot. The addition of the Chef Wild bonus brings this classic machine into modern times – the perfect past time for gamers new to online slots or those who are seeking a sense of nostalgia. Now check out our 99 time slot.